As per report in the ‘Breaking News’ the tourist arrivals through visa on arrival increased at a CAGR of 120.99 per cent during 2010-17 to reach 1,697,175 tourists in 2017, as per a Tourism and Hospitality by IBEF. Indian government has also released a fresh category of visa – the medical visa or M visa, to encourage medical tourism in India. Foreign tourist arrivals for medical purpose increased from 427,014 in 2016 to 495,056 in 2017(P). In June 2016, the In-dian government approved 150 countries under the visa on arrival scheme, including Australia, to attract additional foreign tourists. Sydney’s newest attraction is exciting Lights, Camera, Bollywood experience at Madame Tussauds Sydney. The new zone invites guests to step backstage and join Priyanka Chopra Jonas and Shah Rukh Khan on a movie production set where you take the starring role in your favourite iconic Bollywood film scenes such as Dilwale Dulhania Le Jayenge (DDLJ)! Next up, it’s time to master a Bollywood dance routine in the rehearsal studio, grab an outfit and head centre stage and into the spotlight for the performance of a lifetime! Mark Connolly, General Manager at Madame Tussauds Sydney, said, “We regularly ask our guests which interactive experiences they would like to see at Madame Tussauds and which of their favourite celebrities they would like to see featured. Bollywood is regularly requested – by locals, international visitors from India and from guests around the world. We knew it was time to bring Bollywood to Sydney. Bollywood is the world’s largest and most vibrant film industry and Lights, Camera, Bollywood at Madame Tussauds brings that electricity to the attraction. Bollywood (a portmanteau for Bombay and Hollywood), the informal term for the Hindi-language popular film industry based in Mumbai, often becomes the face of “Indian cinema” as a whole. 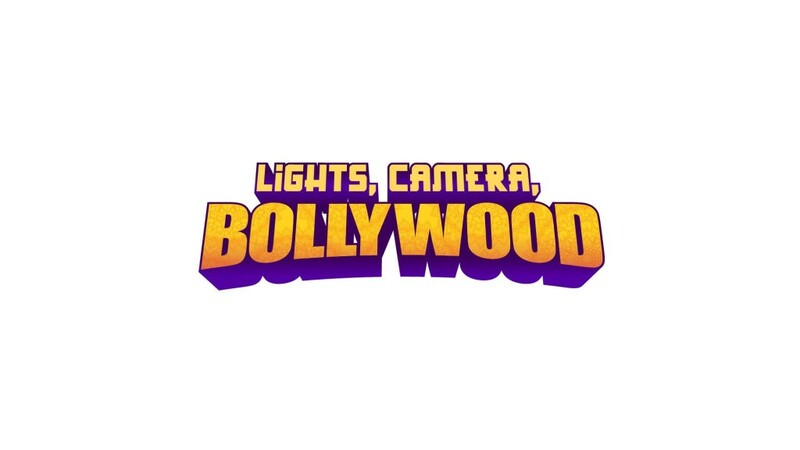 Lights, Camera, Bollywood is open in time for the upcoming school holidays and will be a permanent feature at Madame Tussauds Sydney. 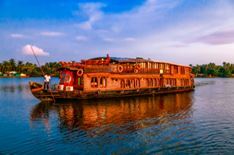 Delhi based Far Horizons recently launched seven nights cruise through the Backwaters in the state of Kerala. This longer cruise has become possible as the locks separating salt from fresh-water has been modified to allow for the sailing of larger boats. Due to this great development the only nine cabin canal cruise boat in Kerala RV Vaikundam, which is capable of sailing through even narrow canals, will start a seven nights cruise program from Kochi till Alleppey! Sailing through the emerald waters of the palm tree-lined Backwaters combining lagoons, lakes, rivers, and canals, it is so aptly described by National Geographic as the Green Venice of the East! In many places, sailing will be almost twenty feet above the surrounding paddy fields where the canals are held together by dyke. In some places, you sail through large lakes and then into narrow canals where the boat just fits in. Then there are places where separation from the Arabian Sea by a narrow beach! Not to forget the spectacularly orange sunsets over the waters making the waters awash with bright colors! Journey includes visit to temples, churches, market places, brass makers, coir makers, martial arts centers from where Karate was born. Cycle through sleepy villages and canoe through tiny canals along with houses, boat safari through a bird sanctuary, visit a traditional wooden boat building yard and see how the famous Kettuvallum is made with the stitching of the wooden planks with coir rope to build boats without using a nail and experience the ancient science of Ayurveda! Foreigners arrive India for many reasons – tourism, business, education and pilgrimage but what’s going in the recent time is for medical treatment. As per Ministry of Tourism report medical tourism industry may grow by 200% by 2020, hitting $9 billion As it tries to expand the industry, the country is trying to make it easier for people to come for medical reasons. It’s touting advanced facilities, skilled doctors and low-cost treatment but also traditional practices such as yoga and Ayurveda. In 2015, India ranked as the third most popular destination for medical tourism, when the industry was worth $3 billion. 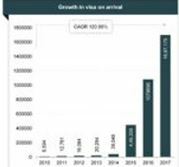 The number of foreign tourists coming into the country on medical visas sat at nearly 234,000 that year.By 2017, the number of arrivals more than doubled to 495,056, government figures show. Visa rules have also been changed to encourage applications.The e-tourist visa regime has been expanded to include medical visits as well. Medical and medical attendant visas have been introduced to ease the travel process of medical tourists. The maximum duration of stay in India under the e-medical visa is a longer duration of six months. 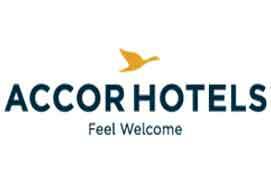 Accor announces two majestic hotels in India – Raffles Jaipur and Raffles Udaipur- in the presence of Accor Chairman & CEO Sébastien Bazin and owner, Ratankant Sharma. The iconic Raffles brand is synonymous with luxury and extraordinary adventure and this announcement signals a new direction for Accor in India, with a stronger focus on luxury and premium brands. Both hotels will deliver a palatial experience in an extraordinary setting along with the famously discreet and personalised Raffles service. Raffles is renowned for setting the standard for luxury hospitality for over 130 years. With 13 properties across 11 countries, each Raffles hotel represents a carefully curated experience in the most distinguished addresses in the world. Since joining the Accor network in 2015, the brand has undergone a renaissance, with a strong pipeline that will see the portfolio double in the next few years. India’s state of Rajasthan is unique for its rich heritage and tradition and is famous for its spectacular palaces and forts, which makes it the perfect setting to continue the Raffles legend. Jaipur forms part of the culturally rich tourist circuit known as The Golden Triangle, which comprises New Delhi, Agra and Jaipur; while Udaipur is a natural extension of this given its proximity to Jaipur. Both cities are renowned as epicentres for the highest levels of luxury, so it makes sense that the Raffles brand will make its presence in both. For the well-travelled, both Rajasthan and Raffles represent a perfect confluence of adventure, luxury, gastronomy and discovery. Raffles Udaipur will open in 2020 and Raffles Jaipur in 2022. As per recent reports, the domestic market of India continues to perform strongly, again registering double digit growth over the year to February, according to International Air Transport Association (IATA). China and Russia topped the growth chart with 11.4 per cent and 10.1 per cent year-on-year growth rates respectively. This marks the 54th consecutive month of double-digit domestic RPK growth for India. A generally solid economic backdrop, combined with continued growth in the number of airport pairs have all contributed to this sustained growth performance. 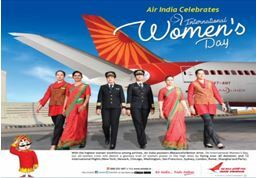 Air India operated 12 all-women crew flights on its medium and long-haul international routes and over 40 return domestic and short-haul flights all over India to celebrate International Women’s Day on 08th March, this year. 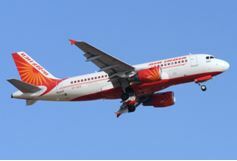 On this occasion, the women cockpit and cabin crew of Air India handled wide and narrow body aircrafts in its fleet to all corners of the world including Delhi – Sydney sector and across the nation to salute woman power in sync with our socio-cultural ethos of our country. Seldom has a single airline scheduled so many flights – operated by its women employees – setting a benchmark to reiterate the equal role and opportunity women rightly deserve in any organisation. Sydney will once again glow with creative lighting this winter again up this May and June for the Vivid Sydney – the largest festival of light, music and innovative ideas in the Southern Hemisphere. The just-released program is packed with with innovative art installations and events, from hands-on workshops to thought-provoking talks to intimate concerts. Destination NSW CEO and Executive Producer – Vivid Sydney, Sandra Chipchase said, “Australia’s most loved and awarded festival, now in its eleventh year, will bring together light artists, music makers and brilliant minds to showcase Sydney as the creative industries hub of the Asia-Pacific. 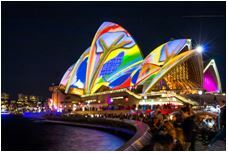 Vivid Sydney is owned, managed and produced by Destination NSW, the NSW Government’s tourism and major events agency, and in 2018 attracted 2.25 million attendees, delivering $172.9 million in visitor expenditure into the NSW economy. “I am proud to say our marketing activities saw a record 185,887 travel packages sold to domestic and international visitors for Vivid 2018 – an increase of 37 per cent over the previous year. Vivid Sydney is a must-attend event for travellers and motivates people to visit Sydney and beyond,” Ms Chipchase said. Ms Chipchase also announced the inaugural Vivid School for High School students in years 9-12 to assist students to learn more about the creative processes involved in imagining, designing and delivering light-based artworks for this huge global event. “This initiative will enable students and their teachers to meet the professionals behind Vivid Sydney’s iconic building projections and light walk installations, and to hear from artists, designers and technicians about their career paths and how they harnessed opportunities to build their skills for future projects and employment,” Ms Chipchase said. 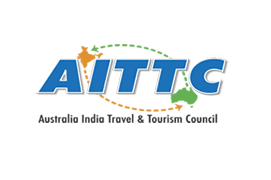 Tourism Australia in India won ‘Best Foreign Destination’ recognition at the recent South Asia Travel & Tourism Exchange (SATTE) 2019. Hosted by UBM India, SATTE is South Asia’s leading travel trade show. The award-winning submission focused on the ‘Undiscovered Australia’ campaign and its marketing and distribution efforts.Some of the key projects included television and digital advertising, content partnership with ESPN Cricinfo and Conde Nast, Airline Marketplace, PR initiatives, and cooperative campaigns with key distribution partners.